Rette Sich Wer Kann , Ronald Wettering, Walter Müllers Spielewerkstatt, 1993. 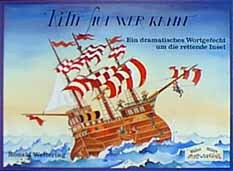 Rette Sich Wer Kann is an excellent game of diplomacy, manipulation, and social interaction. Loosely translated as Save Who You Can or Every Man for Himself and affectionately known as The Lifeboat Game , this game crams more arguments and alliances into an hour than a weekful of Senate hearings. In fact, those who love Avalon Hill's Diplomacy or Reiner Knizia's Quo Vadis? probably will enjoy this game. Those who dislike conflict or backstabbing their gaming friends likely will hate this game. Place a leak in one of the boats. Each player selects a passenger to jump out of a boat. Each player attempts to swim back in another boat. Placing the leak and moving a boat forward are determined by voting. 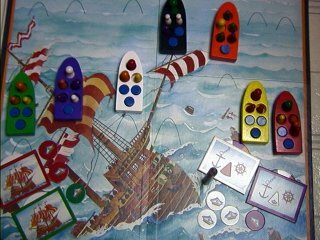 Each player receives a colorful voting wheel to select a boat by color and the votes are revealed simultaneously. Additionally, if there are more leaks that seats in the boat, players must vote for who must leave the boat and drown. In this special vote, each player receives one vote per passenger and two votes for each of the larger "ship's crew" pawns. The plurality vote decides who stays and who goes. Ties are settled by the holder of the important Big Stick, a wooden dowel passed from player to player in turn. One important exception to the voting rule is "The Captain's Hat," which may be secretly selected during a vote, up to three times per game. If one usurps the captain's position, one may override majority rule and determine the outcome of the vote. On the other hand, if more than one passenger selects the Captain's Hat, the hat tokens are discarded and have no effect. The vote proceeds as normal as the two players fight over who will be captain. 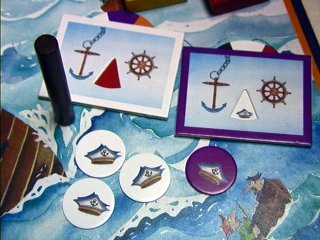 The goal of all the players is to reach the set of three islands at the top of the game board. Those landing on the island are awarded between 5 and 8 points depending on whether they are a regular passenger or ship's crew. At the end of the game all points are tallied and a victory is awarded. This game has been a big hit with every group I've played. Even first timers grab hold of the rules and are striking deals and making pacts very quickly. For some reason, I have often been on the short end of various evil boating alliances and tossed into the drink. Perhaps it is a case of students attacking and allying against thier teacher. Perhaps I have some hidden Captain Bligh tendencies that evoke a mutiny. Nevertheless, the games have always been fun for player and spectators alike. It is usually the loudest and most argumentative game going. There are always loud screams as players reveal their votes and one realizes they are at the short end of a double-cross. The game components are first rate with large blocky wood ships that float in the bathtub and 6 players worth of wooden pawns. Had this been some other manufacturer, I'm sure we would have seen carboard ships and passenger counters. The artwork is early Doris Matthaus watercolor and can be seen in the pictures: cartoonish, humorous and chucklesome. For those that like wheeling and dealing this is a great game, and I recommend it highly. It emphasizes talking and interaction and would certainly lose much of its appeal if it were translated to a computer game. The game is now 6 years old and is tough to find, but I don't think it has lost any appeal. [an error occurred while processing this directive] Last modified: Thursday, 09-Jun-2011 12:36:57 MST.